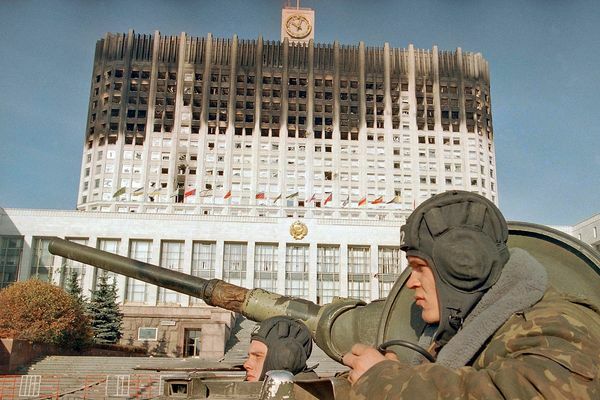 Exactly 25 years ago everything in Russia was very hectic: 3 and 4 October, the conflict of the Supreme Council with President Yeltsin have reached the highest point. According to official figures, over two days, the country lost at least 157 people. Live spectators watched the assault of Ostankino, the White house shooting in Moscow of tanks and street fighting. We have collected little-known facts that the anniversary of these events usually do not remember. "Neither peers nor gentlemen, nor crappy"
Albert Makashov was Colonel-General, former commander of the 20th guards army and the Volga-Ural military district. In late September 1993, he arrived in the White house and became one of the organizers of his defense. October 3, acting President Alexander Rutskoi called on to seize the mayor's office and television center "Ostankino". 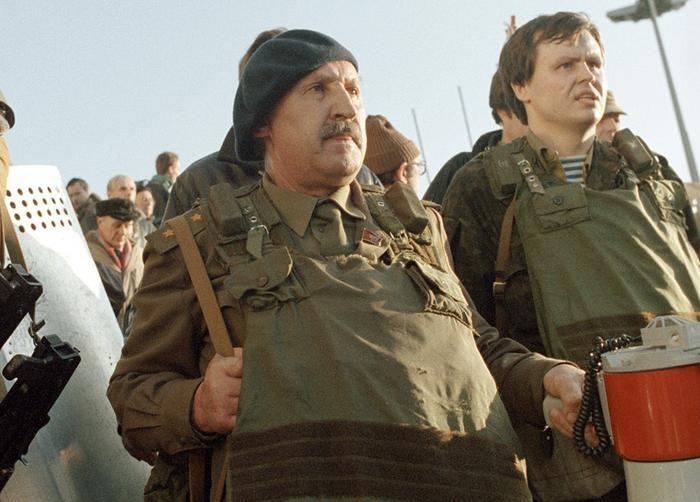 In those days, Makashov was wearing given to him by one of the defenders of the Supreme Council of the black beret marine. The mayor's office went to Makashov, saying "I will not have any more mayors, no Sirs, no peers, no Dicks! ", which was met with applause. Then the General led the March on Ostankino, which failed and ruined dozens of lives. After the defeat of the Supreme Council Makashova arrested along with other leaders, and released under an Amnesty in 1994. 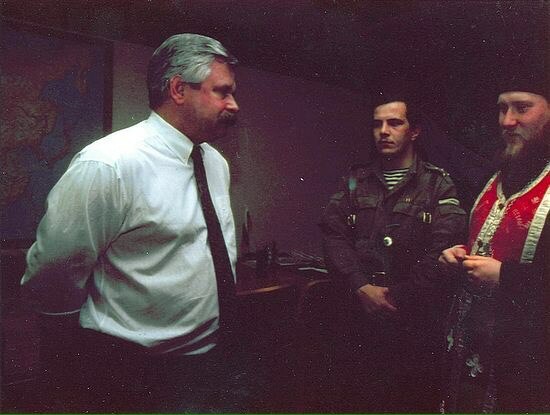 On the evening of 3 October 1993 during a failed assault of Ostankino in the walls of the White house held a meeting of the Supreme Council of Russia. On it the Chairman Ruslan Khasbulatov applause from the audience told about the capture of the television station as an already accomplished fact. Moreover, he announced the early plans to storm the Kremlin. Viktorov was clearly uncomfortable in the Studio, and he looked around. In an attack of supporters of the Supreme Council of the special forces soldiers guarding the television station, was opened on the demonstrators fire, which affected and random people. "Ostankino" did not come under the control of the Parliament, Khasbulatov so very rushed. "The fate of our unhappy Russia! The homeland is in danger, don't sleep! We threaten terrible things, again, come the Communists!" Among the dozens of casualties on both sides stand two deaths. Film Director Alexander Sidelnikov worked at the Studio "Lennauchfilm". 1992 was the peak of his short creative life: he released his penultimate and the bulk film "Vologda song". He and another picture of the "Computer games", was awarded the prize "Nika" in the category of popular science film. Sidelnikov died during the filming of a documentary about the events in 1993 in Moscow during the storming of the White house. In 1993, the festival "Golden knight" award was established for them. 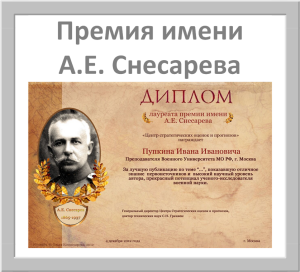 Alexander Sidelnikov "the best direction". 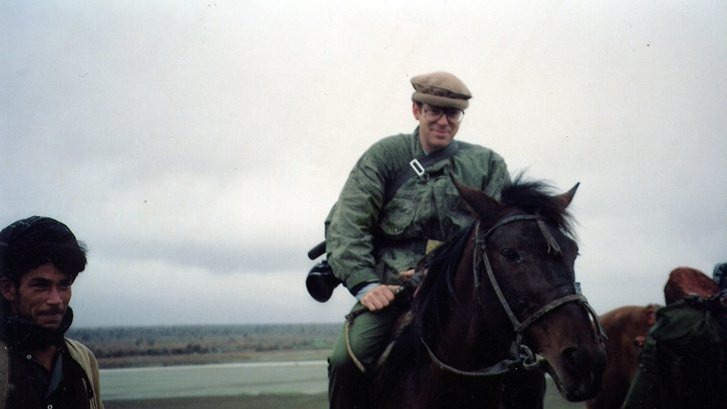 And in the assault of Ostankino killed freelance reporter and cameraman of Anglo-Irish descent Rory peck. On the evening of 3 October, he filmed the material for the German broadcaster ARD. 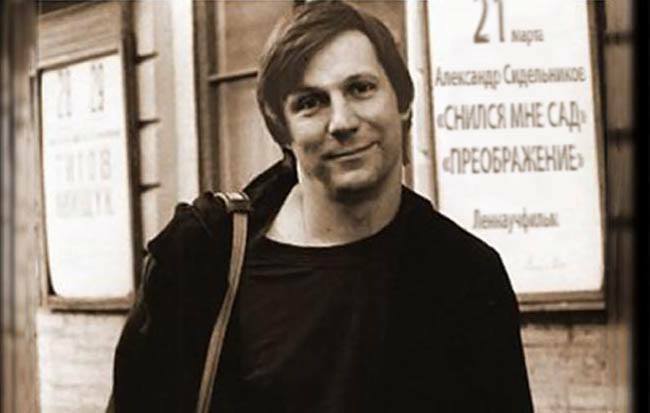 Peck was shot and killed by soldiers of a special unit of the MIA of Russia "Vityaz", guarding the building of the television center from supporters of the Supreme Council. In memory of the pitch was established charitable Foundation in his name. It supports operators, suffered during the performance of their professional duties. Religious leaders and then had a significant influence on Russian politics. For example, Hieromonk Nikon (Belavenets) during the tragic events of the beginning of October was in the building of the Supreme Council, where he provided spiritual support to the besieged. "Then, in August of 1993, I was in the building of the Supreme Council, was looking out the window on this rally. The meeting with the deputies, which took place these days, helped me to better understand the meaning of a confrontation between the President and the Supreme Council, which is already strongly marked. And the argument is pretty clear, with the figures in the hands of the representatives of the Supreme Council, it was clear that the stumbling block was privatization, which then actually bypassing any legislative base was carried out by Yeltsin and Chubais," said Nikon. The world had spread and shot taken on the morning of 4 October 1993. 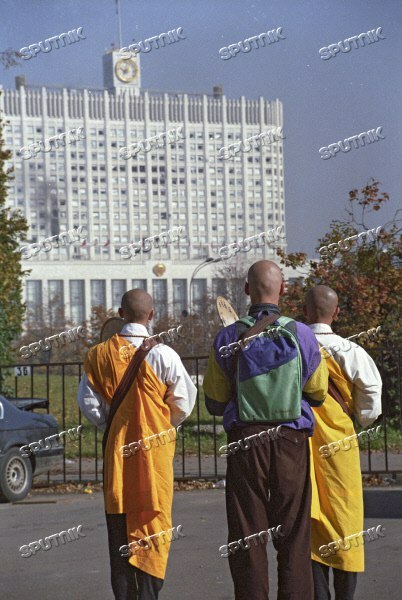 It Buddhist monks pray for the cessation of confrontation and bloodshed near the White house. As you know, this is not very helpful. As the Buddhists were near the White house — no one knows. 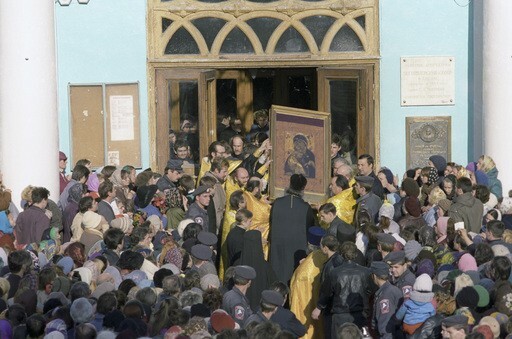 But already on 3 October, Patriarch Alexy II prayed "for the salvation of the power and quench it of discord and of strife” before the miraculous icon of the Vladimir mother of God brought from the Tretyakov gallery. After the procession, he said that the one who first shed blood, is anathema. 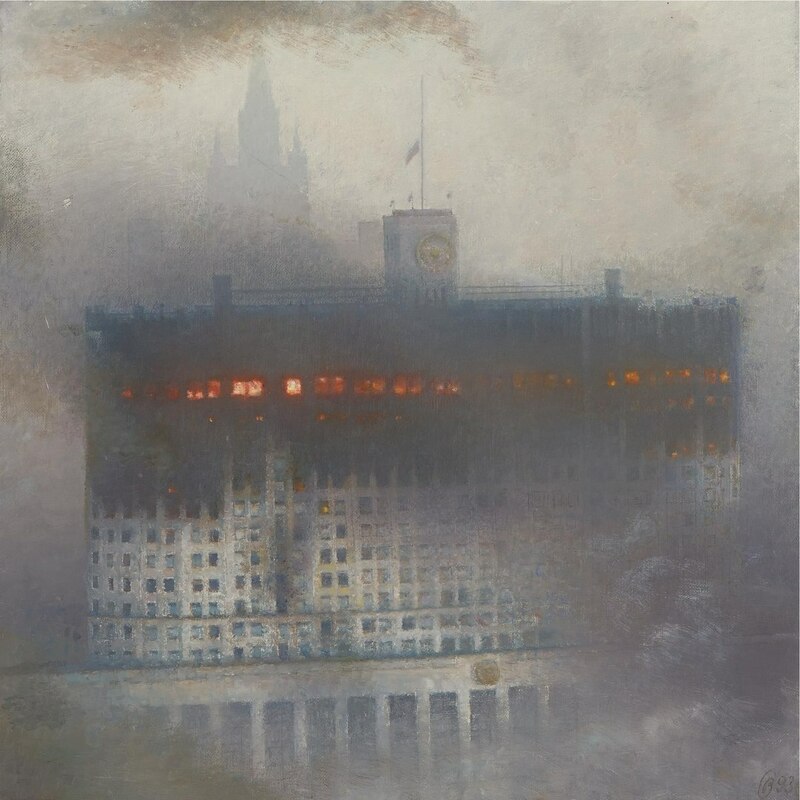 Painting by Oleg Vasilyev from the "White house. 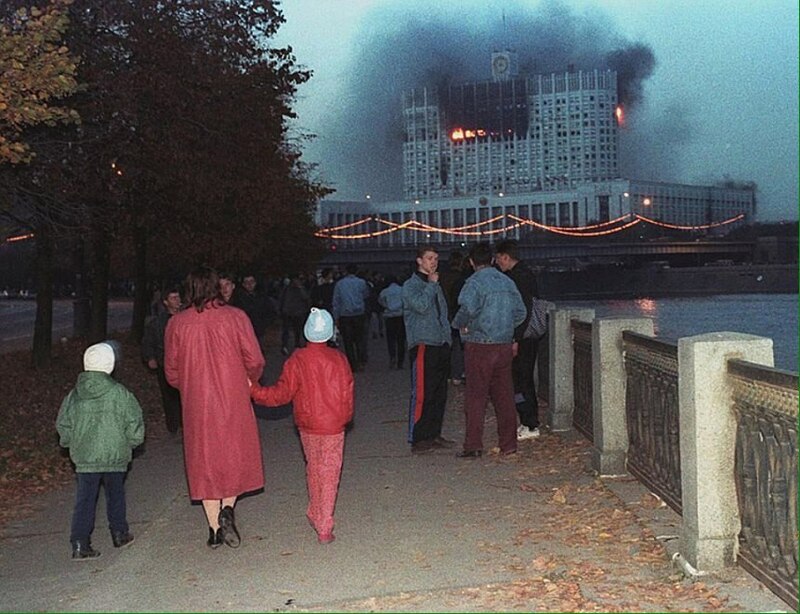 October 1993" depicts the burning White house, shot from tanks of the army, under the control of Yeltsin. Interestingly, it was sold at Sotheby's auction in new York in April 2008 for $157 thousand instead of the intended $40-50 thousand. But simple shots with the burning Parliament look very impressive. Late renovation of the building began operating Affairs of the President Pavel Borodin. "The white house was in a terrible state. Out of 185 thousand square meters burned 80 thousand, mostly the upper floors. The building was completely looted — no furniture or even the flooring was not. Yeltsin called a meeting in which our valiant builders of Moscow Luzhkov and resin have been told that the repair will be delayed for three to four years. Yeltsin answered: "What three or four years? To me it is necessary to place the government and the Duma will qualify". It worked 210 companies, of which 49 Turkish. Six thousand men worked around the clock in three shifts. For a few months, they all did." Citizens were looking for a convenient place to monitor events.